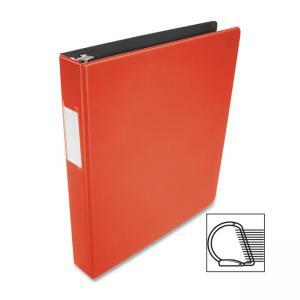 Slanted D-ring binder is designed for maximum sheet capacity. Rings are mounted on the back cover for lay-flat visibility and long-last durability. No-gap D-Rings stay tightly closed without gaps and hold 25 to 40 percent more paper than the same size round rings. Nonglare CleanView cover and pocket material resist toner transfer so ink from printed papers won't stick or mark binder, leaving a clean impression over time. Three-ring binder also offers two clear interior pockets for additional document storage and double opening/closing boosters. Label holder on spine allows easy identification. Binder is made of PVC-free polypropylene covering sturdy chipboard for durability.